PG Dip Architecture student Cephas Williams knew that London South Bank University's (LSBU) central London location would be valuable to running a business. But he didn't realise that LSBU would also offer him a wealth of opportunities and business support through the Student Enterprise team. 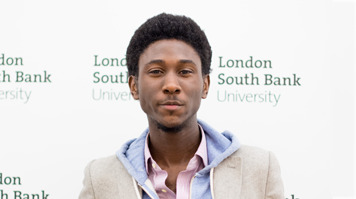 When he joined LSBU, Cephas had already begun developing Greeate Careers, a social enterprise that aims to inform and inspire young people to make better decisions about their future careers. Through various projects, he hopes to encourage students to explore their potentials and their prospects. "I feel young people don't have as much control as they could over what they can and can't become in life. How can people hope for something they have little or no knowledge about? Greeate looks to open the doors of information," explains Cephas. Projects include an online video series where professionals talk about their career journeys and advise, and a series of events where professional women in leadership positions share their work experiences with young women. The social enterprise also runs a six month programme giving college learners interested in politics real-life insights into how political careers work. "One day I walked past the Clarence Centre and went in to ask about office space. I ended up chatting to a Student Enterprise advisor who told me about the EiA scheme," Cephas recalls. EiA (Entrepreneurship in Action, now called Spark) is a year-long programme that helps students start their own businesses by providing guidance, office space and start-up funding. "Having office space, an address and professional spaces to utilise has given my business a real footing. I have met so many interesting people and made valuable business connections," says Cephas. He also took part in Student Enterprise's annual Pitching Competition, where he won £200 and a membership to prestigious leadership organisation the Institute of Directors (IoD). "EiA opens up the door of opportunity for young business starters. Student Enterprise can't guarantee success, that's down to the individual. But the team is keen to help you and give you the best chances for success," he comments. Cephas is now taking Greeate to the next level through an LSBU entrepreneurial six month programme where students and graduates receive intensive support through mentoring and workshops delivered by investors, business experts and successful entrepreneurs. "We hope to one day be an effective hub for young people from around the world to come and find out valuable information about their future and career," he says. Cephas Williams has since gone on to found Drummer Boy Studios and set up the highly successful campaign "56 Black Men", challenging negative stereotypes of black men in our society. The campaign features, amongst others, Tottenham MP David Lammy.